This article contains information which is outdated and incorrect for the current version. You can help Space Engineers Wiki by updating it. 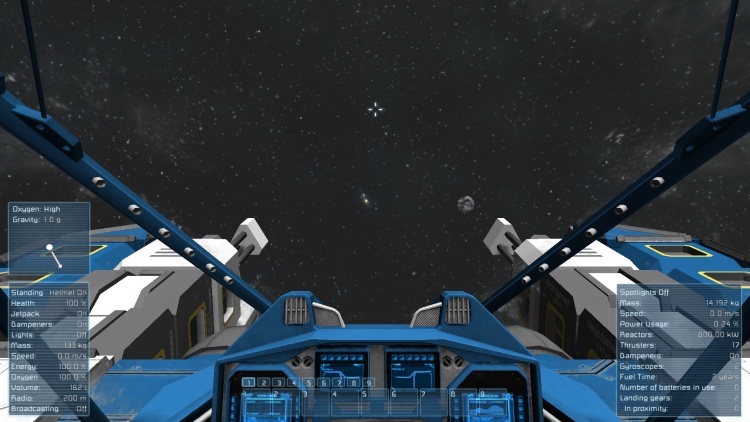 The HUD is information on the screen to help the player build and navigate within the game. It can be hidden and again revealed by pressing (default: Tab). Located on the left side of the screen, the information panel displays important information that directly affects your engineer. 1 Helmet Indicates the status of the engineer's helmet. 2 Jetpack Indicates the status of the engineer's jetpack. 3 Broadcasting Indicates the status of the engineer's built-in suit antenna. This allows communication with nearby antennas in a 200m range, and shows the name of the player on their character. 4 Flashlight Indicates the status of the suit's built-in flashlight. 5 Health Shows the player's current health. If this reaches zero, you will die. 6 Oxygen Shows the player's current oxygen supply. This will deplete whenever your helmet is on. If it reaches zero, you will start taking damage. 7 Energy Shows the player's suit power supply. It depletes on its own, and with tool use. 8 Hydrogen Shows the jetpack's propellant (hydrogen) supply. If it reaches zero, you will be unable to use your jetpack. 9 Speed Shows the player's current speed. The gauge scales automatically if you have a speed mod installed. 10 Dampeners Shows the status of the player's inertial dampeners. The toolbar is where you place the blocks & tools you wish to use. It also has an additional function in that it can switch between 1-9 presets (default SHIFT+1-9). This lets the player store multiple customized bars - See Controls for more information. The toolbar also possesses various status and orientation displays. 1 Inventory Shows the current status of the player's inventory space. 2 Hotbar Allows the player to select various tools and blocks from the G-Menu to place in the world. 4 Building Statuses Shows the current status of symmetry, grid alignment and grid size, respectively. 5 Environment Oxygen Shows the oxygen status of the player's environment. You may safely remove your helmet when it reads "High". 7 Navball Shows the player's orientation relative to a planetary horizon (marked with a gray line), the + sign occasionally seen indicates the player's prograde velocity vector. Before placing a block, an additional information box will appear on the top-right corner of your screen. 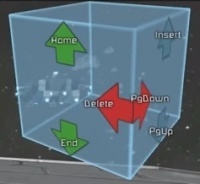 This indicates which buttons will rotate the block in that direction. 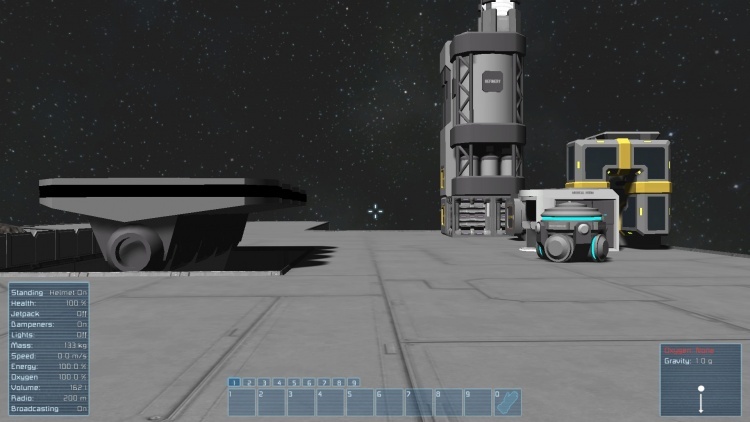 The directions will change depending on the space engineers orientation. Ships & stations share the same interface. 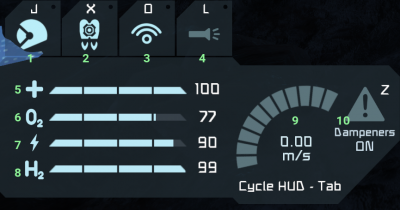 There is some similar information being displayed from the engineer HUD, however when using a ship or station it also includes information about grid itself. Similar in almost every way as if you weren't piloting. The only difference is that your oxygen will change if the ship/station is supplying it directly to the Cockpit. The gravity information is based on your engineer orientation and not the ship/station itself. Located on the right side of the screen, this panel displays information of the ship or station you are currently occupying. Power Usage This combines all your power sources on the ship/station and indicates how much power is currently being used. This indicates maximum output, not remaining power time. In proximity This indicates how many landing gears are within proximity to "Lock"
This page was last modified on 25 April 2019, at 16:58.